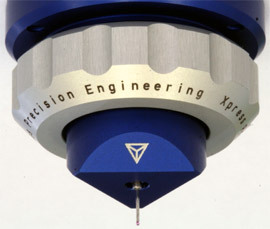 After the successful introduction of the Gannen-XP, which is optimized for ultra precision 3D measurements, Xpress Precision Engineering BV proudly presents the Gannen-XM. The Gannen-XM is the second member of the Gannen series and is optimized for true 3D measurements on micro components and MEMS. The Gannen-XM is fully compatible with the mounting of the Gannen-XP. To minimize preparation down-time, a dual setup is recommended. Probing forces with the Gannen-XM are in the micro-Newton range. The probing system can be delivered with probing tips down to 50 micrometers.